Critically acclaimed and award winning comedy writer, Ryan Paul James has written for both stage and screen. One theatre critic compared him to Neil Simon calling him "The Neil Simon of his generation". Another critic said, "Ryan Paul James is an American playwright to watch". Ryan has written ten plays that have entertained audiences all over the world. He's been recognized in both newspapers and magazines as being one of the funniest writers in theatre. Ryan has also written for television and has created TV shows that have gotten the attention of some major networks. Ryan Paul James' "The Love Brokers" Wins The Script & Storyboard Competition!!!! Ryan's latest pilot "GRIDIRON DAD" gets nominated for best TV Script!!! Ryan Paul James’ first brush with fame came at the age of 6, when his name was listed in The Laker/Lutz News. “I was playing Little League there, with the Red Sox. All of the players were mentioned there in an article,” said James, a former Land O’ Lakes resident, now an actor and writer who lives in Los Angeles. The show is about a pair of actors who were famous as children and are attempting a comeback, decades later. Melissa Disney is married to Ryan Paul James, who grew up in Land O’ Lakes. He’s shopping a television pilot, ‘The Comeback Kids,’ and she’s an acclaimed voiceover artist. She’s also related to Walt Disney, although she never met him. While no one has picked up the television show yet, it has been screened at film festivals in such places as Los Angeles, Honolulu, Miami, Switzerland, Australia and London. It also has picked up a number of awards. It’s a project James has been working on for five years. He’s written eight episodes of the show and has casted most of them, with different stars who would be making appearances as themselves, or performing a role in the sitcom. The TV pilot most recently screened on June 10 at The Chinese Theatre in Hollywood. James said his desire to act began when he was a young boy, when his dad was a wildlife officer and the family lived on the grounds of Pine View Middle School in Land O’ Lakes. “Living in the middle of nowhere and playing there on the campus of Pine View, I would let my imagination go. “I remember, that, like for a year, they were building their (Pine View Middle) gym. I don’t think I can get in trouble for this anymore — but I would go in there and play Indiana Jones,” James said. “I would watch probably too much television,” he added. His acting debut came in 1994 when he played the role of a Mousekateer on the Mickey Mouse Club, filmed in Orlando. His acting teacher, who was the show’s casting director, got him the gig, he said. He knew from the beginning the role would be a short run. “When I was brought on, they’d already announced that the show was cancelled,” James said. He replaced a cast member who wanted to go to Los Angeles to pursue a music career. James moved to Los Angeles in 1995 to attend the American Academy of Dramatic Arts. But, that didn’t last long, either. “I was so homesick, and I hated L.A. — could not stand it,” he said. So, he returned to the Tampa Bay area, where he became a disc jockey on 100.7 Kiss FM. “I wasn’t really looking to get into radio, but it just happened for me. I bounced around to a couple of other radio stations. A radio station out here in Los Angeles heard one of my air checks, and they called me up and wanted to see if I would be interested in coming out here,” he said. He wasn’t sure what he wanted to do. So, he prayed about it. “I was like, ‘God, you’ve got to give me a sign here’,” James said. He knew he couldn’t afford to move to L.A., but within a month of his prayer, he had booked two national commercials and had received the offer from the radio station. “Here I am, 12 years later, married, with a kid,” James said. His wife, Melissa Disney — a cousin of Walt Disney — is a voiceover artist. Though not a household name like her cousin, she has attracted her own share of fame. She narrated the trailer for the action movie, “Gone in 60 Seconds,” — widely credited as one of the first major movie trailers to employ a female voice, according to The Hollywood Reporter. She also has voiced The Academy Awards, The Emmy’s and the Billboard Music Awards. While James and his wife work in the industry, their 4-year-old son, Ryder, gets a chance to dip into the lifestyle, too. He already has met such international stars as Madonna, Harrison Ford and James Earl Jones. 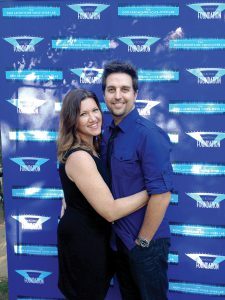 Although the Land O’ Lakes native has lived in L.A., for a dozen years, he still gets homesick and travels back to the area to visit family a couple of times a year. Every time he comes home, he must make one stop before returning to L.A. He drops by Larry’s Deli, on Land O’ Lakes Boulevard, where he loads up on Cuban sandwiches to take back to California. The mere mention of them, James said during a recent telephone interview, makes his mouth water.